Some funny things happened on last night's Rachel Maddow Show on MSNBC. In case you don't know, Rachel is a liberal political commentator on a cable TV channel that is commonly regarded as liberal -- the polar opposite of Fox News. 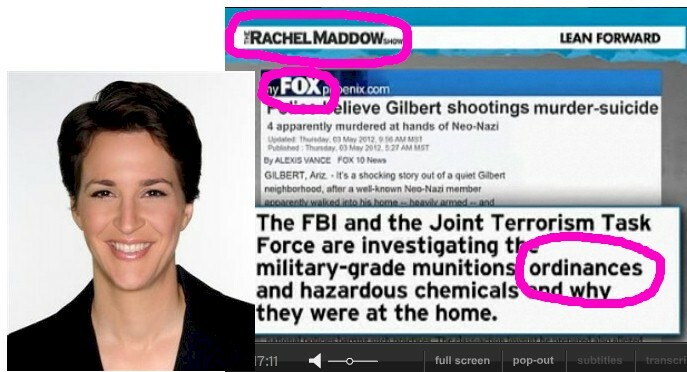 Funny Thing Number One: Rachel quoted a news report that originated with Fox. Funny Thing Number Two: The text included the wrong word: "ordinances." "Ordnances" -- with no "i" -- would have been the right word. 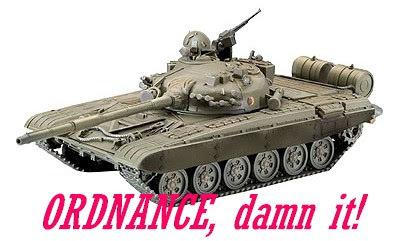 I think that most people who see the word "ordnance" think it's misspelled, and that it should really be "ordinance." Actually, "ordnance" can be a properly spelled word. Sometimes "ordnance" is improperly corrected by adding an "i." Sometimes "ordinance" has to be corrected by eliminating its "i." An ordinance is a law or other government regulation. Ordnance is something that goes boom, like a cannon or a bomb. An ordinance can deal with ordnance. When I was a kid I assembled a Revell model tank. The box came with a zillion plastic parts, an assembly diagram and a sheet of decals to make the plastic tank look more realistic. One of the decals on the sheet was a label that said, "U.S. Army Ordinance." There was also a smaller sheet that said almost the same thing -- without the erroneous "i." You misspelled the word yourself! - "An ordnance is a law or other government regulation." I believe that should be "ordinance."